Thanks Jim... I'll look a bit more at aliexpress. I guess I'm looking for something that is enclosed with the power cord already attached. I don't like playing too much with the 120V side. Thanks for the quick response JR! Yes, 5V pixels. Currently I have two 5V 8A power supplies (from amazon) to power 3 strings. 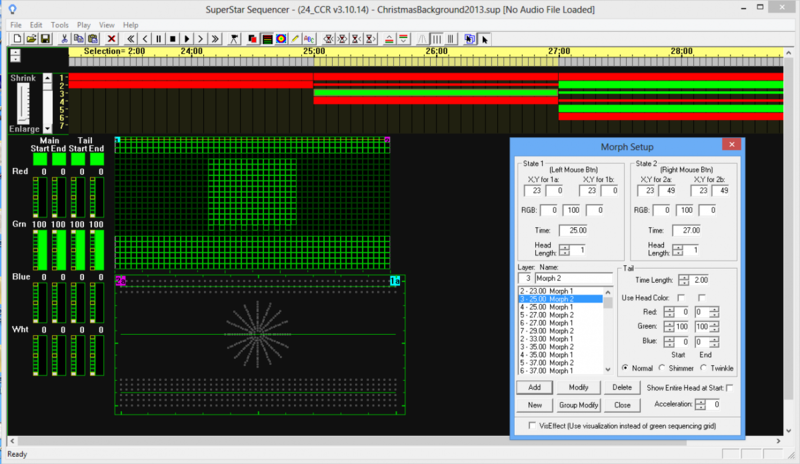 I'm looking at adding more strings... in retrospect, perhaps I should have gone with 12V pixels. Most of the 5V options on amazon (Canada) seem very open/exposed on the 120V side... makes me nervous. The ebay options seem to all be from China... is that safe? Can anyone recommend a good 5V Power Supply to use for a Pixie 8 Controller? I think it needs to supply 25-30 Amps if I'm connecting eight 15W strings (or perhaps I could use two 15 Amp power supplies). LOR only sells a 12V Power Supply. pixel tree kit wont work!!! I had updated to the latest version 4.3.14 on the light-o-rama website download page but couldn't get my pixie to work. I couldn't figure out why the pixie manual said I needed 4.3.15 or later to do the hardware configuration. The open beta 4.3.16 works perfectly. I just didn't have the 'control visualizer' selected under the 'play' menu item in the sequence editor. Works fine now with communication settings set to local host. I mounted them on flexible plumbing tubes that were attached to 2 large metal frame shelves. Has anyone been able to sucessfully configure the visualizer while running windows 8 on a mac via parallels? I've tried communicating by local host and network address without success. I'm using S4 on my mac to build some new sequences and a working visualizer would be ideal. I previously had no problems with the visualizer on a windows only computer. I had the same problem installing S4 onto windows 7. Every time I tried to run the program it would attempt to reinstall S4 and the required temp msi install file was no longer present. It turns out my antivirus software (bitdefender) had quarantined the file "\Light-O-Rama\ServoDogUtility.exe". Once I restored this file and put it on the exclusions list in bitdefender, the S4 software worked correctly. This may explain why you had one file still in use (ie quarantined) that you could not delete. Has anyone noticed the previous posting I made? If so, please reply. I would really like someone to try the new dmx keyword. Basically it works, but I noted two minor issues. I have 3 GE color effect strings run by a SanDevice E682 controller, 2 Cosmic Colour Pixel controllers, and 6 Cosmic Colour Ribbons. I mapped out the GE color effect strings as CCRs using the CCR draw wizard. I have each string on it's own universe and used the dmx keyword accordingly. Two of my GE color effect strings need to be numbered from right to left. When I loaded the visualization into SuperStar, the visualizer was correct but the SuperStar 'green boxes' were numbered left to right for those strings. I tried the 'reverse' keyword but that did not correct the problem. You can see in the screen shot how the example morph goes from left to right in the green boxes but right to left in the visualization. When I ran this sequence on the actual lights, the output was as you see in the visualizer. The second thing I noted was during the export to the sequence editor. My DMX props are at the top in SuperStar but were moved to the end of the channel list in the sequence editor. Not a big deal, but unexpected. I have also attached my visualization file... perhaps there is something that I missed. I had the same problem today while testing out the standalone function. No problems downloading a new sequence to the unit, but unable to delete the sequence so that the unit had no sequence to run. Error message "Unit did not respond to the Clear Command, Retry Command". A hardware reset did work to remove the standalone sequence.... but the 'Remove Sequence - Delete' button still does not work. My controller is called 32LD-G3 Ver 1.05 in the LOR Hardware utility. I gather the CTB32LDg3 Deluxe board is what is inside. I do my best to avoid opening up 120V metal boxes. Thanks for the link Aaron (I had to remove the trailing dot '.' on your link to make it work). This makes alot more sense now. 1	2	+9.7V	?	? G	3	+3.3V	?	? A jumper from Ground (G) to 1, 2, or 3 will trigger inputs 1, 2, and 3 respectively. Can anyone verify this before I manage to fry my unit? The LOR Hardware utility shows 8 potential controller inputs on my unit but I only found 3 of them. Where are the other 5 inputs? Update -- So my five new 1ft ethernet patch cables arrived today. Wow did that make a difference! I can still see some irregularities when all 6 CCRs are fading from white, however the original sequence that I was working on works much better. It looks like one of my original ethernet cables is a bad apple.... That's what I get for using a mish-mash of spare cables. I had initially noticed color errors in a sequence I was working on for my 6 CCR setup... mainly white or close to white colors. Last year I only had 2 CCRs going and this wasn't an issue. I decided to do the all white -> fade test to maximize the number of channels in use and stress the network. I am also seeing color errors occur with moving images. Don: When I test only one CCR there is no problem. I start to see the problem occur once 3 CCRs are going and it gradually becomes worse with each additional CCR. What is the maximum number of channels that can be run reliably on one network? Does anyone have any thoughts on how I can speed up the LOR network? Is anyone else having problems running 6 CCR's on one network? I have 6 CCRs connected through one network. The CCR hardware setting are as suggested in the manuel. Using SuperStar I have set up a scene to have all 6 CCRs fade from white to black over 1 second and exported this to the sequence editor (v3.7.0). When I play this on the sequence editor, the actual CCR ribbons show color errors. Initially, there are columns of non-white colors (approximately 10 over the length of the ribbons) that quickly turn white and then reappear as the white fades to black. Similar errors will occur with other near white colors. After research, I changed the network speed from 'average' to short range 'faster' with some very slight improvement. Just for fun, I changed the network speed to long range 'slower' and this made the problem significantly worse. I don't think my network cables are overly long. I have ordered 1 foot network cables for between the controllers just in case since these cables are now in the 4-10 foot range each. My computer has a 1.6 GHz processor, 2GB RAM, running Windows 7... not the newest computer but far from slow. I have also tested this on a Windows 8 Release Preview via Parallels on a MacBook Air (1.7 GHz i5 with 4GB RAM)... same results. I am using the USB-RS485 Adapter with Booster to create the LOR network. I thought this could handle 6 CCRs at once. Is there a hardware or software setting that I'm missing? Do I need another adapter so that I can set up 2 separate LOR networks? Any ideas how I can get my whites white? It sits in my front window and works perfectly to the end of my street. I'm also confused about the license... in particular what the requirements are for the CCRs. It looks like you really need to get the SuperStar Sequencer addon in order to do much with the CCRs. OR do I need an advanced s3 license with the SuperStar plugin to take full advantage of the ribbons? Also, aren't the CCRs technically a few more that 150 channels each? 150 lights plus macro effect channels?